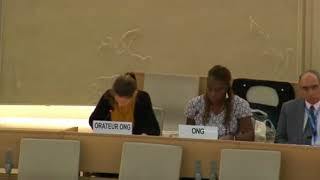 International-Lawyers.Org and Geneva International Centre for Justice welcomes the necessary and timely report of the Working Group of Experts on People of African Descent. It is highly regrettable that racism not only exists in modern times but also in some regions of the world that are considered developed. Racial discrimination including racist and xenophobic hate speech is on the rise even among politicians and people of influence. This type of behaviour can adversely affect mental well-being, and further, when hate speech progresses to violent action, the physical well-being of the targeted is put in danger. We also call attention to the practices of extractive industries, particularly in Africa, that put the health and well-being of people of African descent in precarious and dangerous situations. For example, in the short to medium-term, oil and mining industries result in negative social and environmental impacts, such as soil and air pollution, vegetation destruction, and deforestation; furthermore, workers are not only unpaid but also endure poor health and safe working conditions. Long-term effects of air and land pollution cause illnesses directly and indirectly, as air-conditions become poor and pollutants seep into the crops and vegetation and eventually into foods. These effects are long-lasting and take years to redress. These harmful activities by oil and other extractive industries are in direct contradiction to the SDGs and the spirit of the UN Charter that puts the health and well-being of people ahead of profit and not vice versa. Thus, we ask the panel if studies will be made regarding SDG 3 and People of African Descent in the context of harmful practices of TNCs and extractive industries in Africa and we recommend the WG to dialogue with the Special Rapporteur on hazardous substances and wastes.